Lone Pine Lodge is a beautiful custom log cabin located in the forest just 15 minutes north west of downtown Prescott. 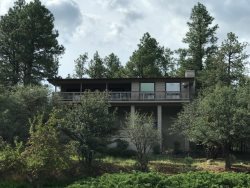 The panoramic views are long and lovely with sights all the way to the San Francisco Peaks! Thumb Butte can be seen from practically every window. This property has 3 bedrooms and sleeps 8 guests. The master bedroom is on the main level and has a king bed and in-suite bath. Upstairs has two more bedrooms. One has a queen and bunk bed twins and one with just a queen. All linens are included. There is a full bath upstairs and an additional half bath downstairs. The western décor is classy throughout the property and includes a lot of unique Prescott accents. A little game room in the loft upstairs has a Foosball table and game table. A small hot tub is on the front deck and faces east for glorious sun rises and evening star gazing. Lone Pine Lodge has A/C, WIFI internet, SAT/TV, DVD and washer/dryer. A huge river rock gas fireplace is the focal point of the living room. The modern spacious kitchen has granite counter tops and stainless steel appliances. All dishes, pots and pans are stocked to make cooking a breeze. A propane grill is on the deck for outdoor cooking. The closest lake is Granite Basin Lake and is within 10 minutes driving from this property. Lone Pine Lodge has everything you want in that upscale vacation in the tall pines. Rates are based on 4 person occupancy. We try to make the larger properties reasonable for smaller parties. It's hard to put one price on a home that's fair for 2 persons or 14 persons. Extra guests are $20 per person per night plus tax. Thank you.